We're back at it, Massachusetts! MASS MoCA’s Assets for Artists program is now accepting applications for our 2018 matched savings grant program and fall workshops. One application, all of MA. This year, artists based ANYWHERE in Massachusetts are eligible to apply with one application. Interested artists are welcome to apply for either or both of our programming tracks. Apply by October 22! A “matched savings” grant that provides working capital help grow the artist’s creative practice. Participants are provided with grants of $1,000 or $2,000 to match a corresponding amount of savings, and the combined amount is used by the artist toward implementing a plan to strengthen their creative practice. Free professional development services, including artist-tailored workshops on financial management and business/career planning. 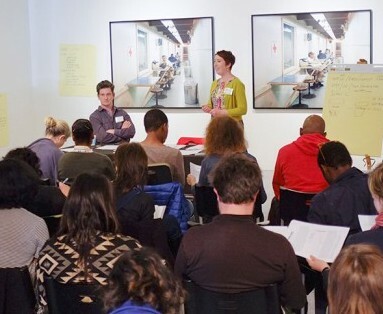 Our free workshops are geared to help artists strengthen their professional practices. This fall/winter, we’re offering six expert-led workshops to help artists in all disciplines. You may apply to participate in as many workshops as you think would be a good fit for you! Jessica Burko is a Boston-based exhibiting artist, curator, and arts marketing professional. In this workshop, Jessica will help visual artists and craftspeople gain a better understanding of how to present their work, how to identify their target audience, and how to create a detailed marketing plan while building the confidence to implement it. On the day following the group workshop, selected artists will be invited to meet individually (for 30 minutes) with Jessica for an in-depth discussion of specific marketing questions and concerns, and to review their arts marketing strategies. Amy Smith, Co-Director of Headlong Dance Theater and Headlong Performance Institute in Philadelphia, has worked internationally as a choreographer, director and performer. In this interactive workshop, performing artists in all fields — music, dance, theater, comedy, and more — will set goals and learn skills they can implement right away. Topics include valuing your time and other issues related to self-employment, long term financial thinking, “real cost” budgeting for projects and for your life, fundraising and other revenue streams, and goal setting for the business of your artistic practice. Amy Smith is a licensed tax preparer working exclusively with artists, and also an acclaimed choreographer, director, and performer. In this workshop, Amy will give an overview of tax preparation for artists, including how not to pay too much in taxes by deducting all business expenses. There will also be information about the effects of the new tax law. Kim Faler is an installation artist who has been awarded Rauschenberg and Artpace residencies and has exhibited at MASS MoCA. In this workshop, participants will create a framework for understanding their practice as a business and a strategic plan for advancing their goals. Participants will receive guidance on improving their artist statements, portfolios, websites, budgeting, time management, and fundraising. Recommended for fine / non-commercial visual artists. Candelaria Silva knows the funding world deeply, both from the applicant and grantor perspectives. This workshop is designed to help artists create a funding base by addressing how to cultivate foundation, business, and individual support; successful grant-writing tips; how networking helps with fundraising; and when/how to use fiscal agents. Click here to apply by October 22! Not located in Massachusetts? Please check back again soon or join our email list for updates and future programming opportunities for which you may be eligible, including the Studios at MASS MoCA residency program. Our work in Massachusetts is possible because of our wonderful funders & partners, specifically the Barr Foundation, National Endowment for the Arts, Massachusetts Growth Capital Corporation, Surdna Foundation, the United States Department of Agriculture, and the U.S. Department of Health and Human Services’ Assets for Independence (AFI) program.